A very small number of children are born without one or both eyes. This can be related to some illnesses during pregnancy, such as rubella or chicken pox, or other disruption during the delicate development within the womb. It is also becoming apparent that there are some genetic links. Sight can’t be restored, but children with this condition may benefit from artificial eyes to help with appearance, so it is important that babies born without an eye or with a very small eye are referred for assessment at a specialist centre as soon as possible. If this condition is affecting your family, get in touch with MACS, the Micro and Anophthalmic Children’s Society which has a helpline: 0800 169 8088, email: enquiries@macs.org.uk and website, www.macs.org.uk. A very small number of children are born with eyes that are small and don’t work, known as microphthalmos. This can be related to some illnesses during pregnancy, such as rubella or chicken pox, or other disruption during the delicate development within the womb. It is also becoming apparent that there are some genetic links. Sight can’t be restored, but children with this condition may benefit from artificial eyes to help with cosmetic appearance, so it is important that babies born without an eye or with a very small eye are referred for assessment at a specialist centre as soon as possible. If this condition is affecting your family, get in touch with MACS, the Micro and Anophthalmic Children’s Society which has a helpline: 0800 169 8088, email: enquiries@macs.org.uk and website, www.macs.org.uk. A coloboma is the failure of complete closure that can affect the iris, retina or choroid – both parts of the back of the eye. It happens in the early stages of pregnancy when a part of the eye fails to complete its growth and fuse together leaving a gap. Most commonly this is detected if you spot your baby has a ‘keyhole-shaped’ pupil. It can affect one eye or both, and vision may or may not be affected depending on the part of the eye involved. It can occur on its own or as part of a genetic disorder. A child with this condition should be assessed by a specialist. There is currently no treatment, but the assessment can evaluate whether the child’s vision is affected and deal with associated conditions such as lazy eye or amblyopia. Sunglasses or a hat my help if the child is light-sensitive. Older children may be interested in cosmetic contact lenses that disguise the keyhole pupil. If this condition is affecting your family, get in touch with MACS, the Micro and Anophthalmic Children’s Society which has a helpline: 0800 169 8088, email: enquiries@macs.org.uk and website, www.macs.org.uk. A very small number of babies are born with a problem that causes the pressure to rise in their eyes. 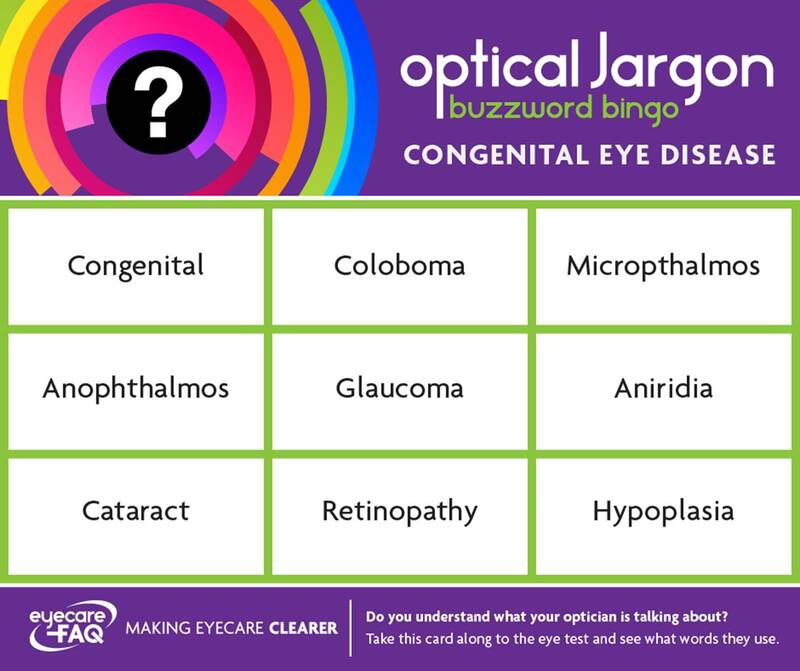 This is known as congenital or developmental glaucoma. The eye needs a certain amount of pressure to keep it in shape. However, too much pressure can damage the optic nerve at the back of the eye. This condition can be genetic. When detected, your baby is likely to be offered surgery to improve the outflow of fluid from the eye and reduce pressure. Medication may also be necessary and your child will always need to have their eyes monitored. The International Glaucoma Association has more information about glaucoma in babies and children. Aniridia is a condition where the coloured part of the eye, does not develop. It may be entirely or partially missing. It usually affects both eyes and can cause poor vision and sensitivity to light. It can be caused by a faulty gene. There is no treatment for aniridia but it can be linked to other eye problems so your child will need to see an eye specialist on a regular basis. RNIB has a factsheet available online all about aniridia. The Aniridia Network is a support network. A cataract make your vision blurry, like trying to look through frosted glass. Some babies are born with cataracts or develop cataracts at a very early age. This can be in one or both eyes. Congenital cataracts can be caused by infections like rubella, medical conditions that affect the baby’s metabolism, or may be genetic and run in the family. Central cataract will affect the vision more than one at the edge. An eye specialist called an ophthalmologist will assess your baby or child’s vision. Some children with cataract may need surgery so that the eye can develop better vision. After surgery they are likely to need glasses or contact lenses. With early detection and treatment many children with congenital cataracts in the UK go on to have a good level of vision for the remainder of their lives. Find out more about this condition from RNIB. Retinopathy of Prematurity (ROP) is when the retinal blood vessels do not develop normally in babies that are born prematurely. It can cause a serious loss of vision if it isn’t diagnosed and treated early. It is more likely to occur in babies that are born very prematurely – particularly less than 32 weeks gestation, have a low birth weight of less than 1500 grams and have needed oxygen treatment. Paediatricians are aware of the risks of developing ROP in babies born very early and will monitor the levels of oxygen a baby is given and the effects it may have on the eye. Most babies that develop the condition now have mild ROP that does not need treatment. In those that need treatment, a Laser is used to remove fragile blood vessels and prevent them from leaking, or causing scarring or retinal detachment. RNIB has a helpful factsheet online which tells you more. Optic nerve hypoplasia (ONH) is a congenital condition in which there is underdevelopment of the optic nerve at birth. The optic nerve transmits signals received in the eye to the brain. ONH can affect one eye or both. It is one of the three most common causes of visual impairment in children. If the nerve in only one eye is affected in a minor way vision can be almost normal but if both eyes are affected in a more major way, the individual may only be able to see large objects and in severe cases not to see even a bright light. The cause is generally unknown. There is no treatment for ONH but children can be helped to make the most of the vision they have. Contact-a-Family has an online factsheet with more information. Strabismus, more commonly known as squint is something that 2-3 children in a hundred will develop. It is not painful, but can cause problems with the development of vision in one eye. Often it is caused by a refractive error such as long-sightedness that can be corrected with specs. Some squints run in families so if a parent has had a squint or needed glasses from an early age there may be an increased chance that their child may also be affected. Other eye conditions such as cataract or damage to the retina can cause the eye to have poor vision and resulting development of a squint. Children who are born before 32 weeks may be at more risk of developing a squint. Children with conditions such as cerebral palsy and Down’s syndrome may also be more prone to develop a squint. You may notice a squint yourself, or it can be detected at a routine eye test. If undetected it can lead to a lazy eye. Treatment may simply involve wearing glasses, or covering the stronger eye with a patch to encourage the other eye to develop. Some children may need to do exercises. In some, surgery is recommended. Treatment of lazy eye is more successful when vision is still developing before the age of 7 or 8 so it is important to take your child for an eye test as early as possible, and definitely before they start school. Nystagmus is continuous, uncontrolled movement of the eyes to-and-fro, side to side or up and down. It can be congenital – something people are born with – and causes reduced vision. It is a sign of a problem with the visual system or the pathways that connect the eyes to the parts of the brain that analyse vision. It can occur alongside albinism, learning disabilities or neurological conditions, or on its own. Nystagmus does not cause pain or progressive loss of vision. According to RNIB, giving children plenty of stimulation in the early years can help them make best use of the vision they have. Your child should be assessed by a specialist to help them make the most of their vision. The condition cannot be cured as yet, but the Nystagmus Network can offer you more information, support and news about research. This month we have taken you through some causes of sight loss and eye diseases that children can be born with. Most of these conditions are uncommon, but there are even more eye problems that affect only a very small number of babies and children each year. RNIB has compiled a list of resources for people with rare eye conditions – read more here. Some people have sight problems from birth. Some are caused by the mother having an infection while the baby is in the womb. This could be an infection like rubella, also known as German measles, or toxocara which comes from animal faeces. Premature birth can also lead to sight problems. Some eye conditions like retinitis pigmentosa are inherited and get worse over time. People with albinism (lack of eye pigment) or nystagmus (shaky eyes) also have reduced vision from birth which rarely changes with age. The most common cause of sight loss in younger adults is injury to one eye. Health problems like stroke can also cause sudden loss of sight. Approximately one in 10 people have reduced vision due to poor development of vision. This is commonly referred to as a lazy eye but the technical term is amblyopia.